Oliver and I were in Catherine’s studio yesterday morning for an emergency Halloween costume alteration when I heard a commotion in the parking lot below her back window. 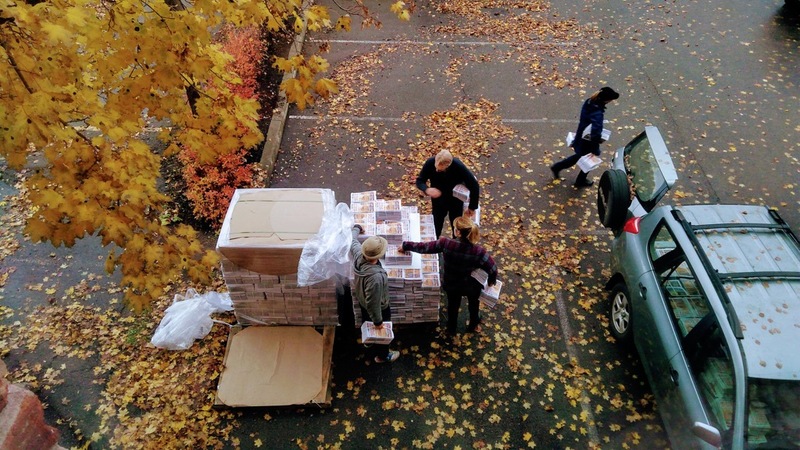 I looked out to see the November issue of The Buzz being unloaded. I’m so used to seeing piles of the paper in coffee shops in quantities of 5 or 10 that being exposed to all of the copies gave me a new appreciation for how much The Buzz has grown since the early years. Written November 1, 2018 at 5:38 p.m.